When Detective Sergeant Barbara Havers' Pakistani neighbor Taymullah Azhar and his eight year old daughter depart unexpectedly for a seaside village, responding to an upsurge of racial tension involving his family, Havers (who has a few issues with impulse control) takes advantage of a mandated holiday from her job and follows them, thinking to aid Azhar in navigating official channels. On arrival, however, she discovers that Azhar's background is more complicated than she realized. 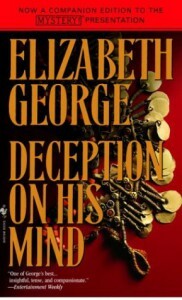 Once she learns that her colleague Emily Barlow is in charge of the investigation, she manages to work herself into the murder investigation that sparked the local Pakistani community's anger, acting as liaison with the leader of the protest group, who is aided by his cousin -- none other than Taymullah Azhar. With no shortage of suspects, both English and immigrant, Barbara finds herself balancing between her duties as an officer of the law and her friendship with the Azhars, and attempting to avoid the racial stereotyping that seems to cloud the vision of the local natives, including some of her fellow officers. Inspector Lynley appears only in absentia, as he has recently married and is on his honeymoon. Personally, I was pleased to see that Havers could carry a book on her own.